I usually make posts about big things I’ve done, and not many about the hundreds of little jobs I do on Tammy Norie. I thought I’d start a series of occasional posts noting these, and if anyone wants more details they can ask in the comments. 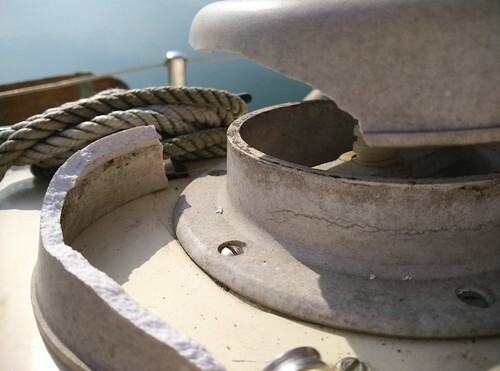 The 30-year-old mushroom vent over the heads compartment cracked. The plastic looked like old ceramic. Replaced, although I don’t much like the quality of the new one. I’ll keep a look out for a stronger replacement. I bought a CTek battery charger before going to the Netherlands in 2015. When I got there, it didn’t work! What’s more, when I tried to return it to the shop, they’d closed down, and their parent company had gone bankrupt. CTek eventually agreed to send me a new one directly, but it has been in its box for two years, untested. 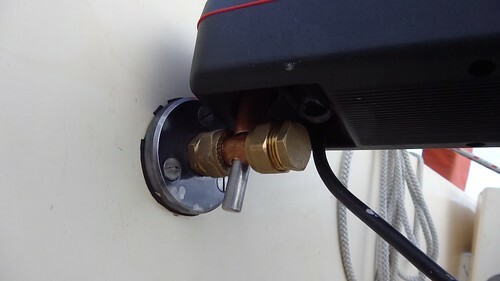 In a rare stay at a marina, I decided to test and install it. 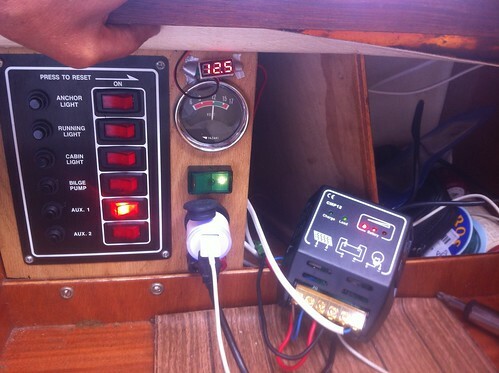 Here it is installed below the main electrical panel in what would be the engine compartment on a bigger boat. 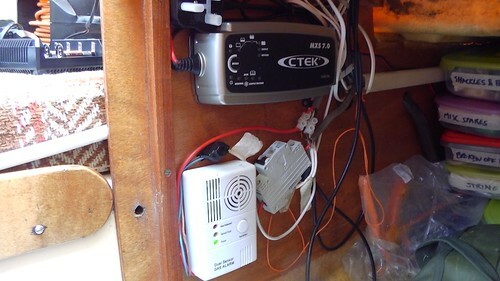 Below it you can see the gas alarm (below head level when sleeping) and a big circuit breaker. 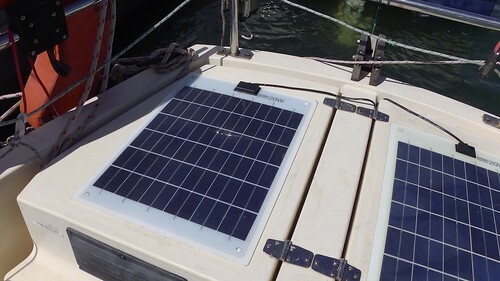 The solar panel regulator promises to prevent overloads, and the every switch on the panel has a circuit breaker too, so I’m pretty well protected from shorts. 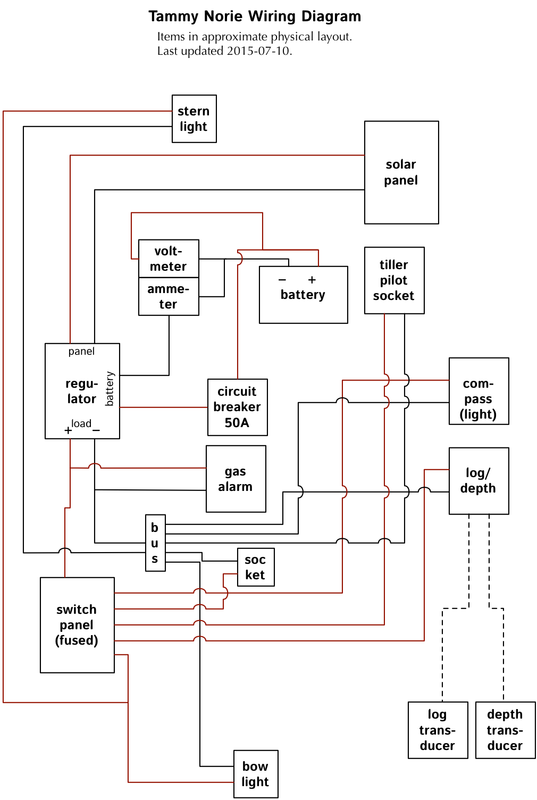 I have a better main breaker for the panel when I re-make it. At the back of the compartment you can see water-tight plastic boxes with spares and parts inside. I label them using tape and a big marker pen, so that I can pull out the right box from deep in the compartment. I shortened the plastic tube I put around my yard parrel to prevent chafe. I can now peak up a few more degrees. I finally stuck down my second solar panel. It’s been attached with duct tape for the past year. In spite of that, it’s never tried to escape overboard. 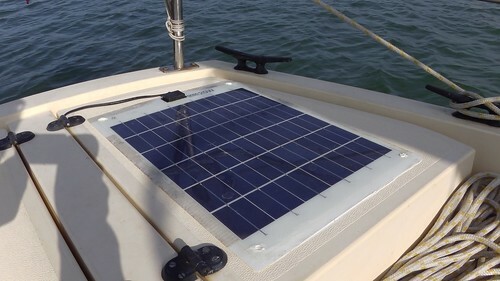 I only really need a second panel because I installed a fancy main radio with GPS and AIS alarms, so I that I could sleep more soundly on offshore passages. 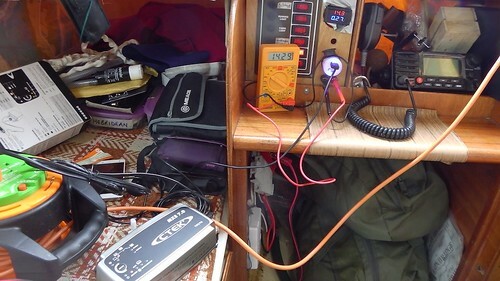 I don’t use this radio much inshore. I fixed yet another leak. This one was through the bolts fixing the pushpit rail foot. This was a good test for butyl tape, which I’m favouring over Sikaflex these days. It’s as easy to handle as Blu-tack and seems very effective. 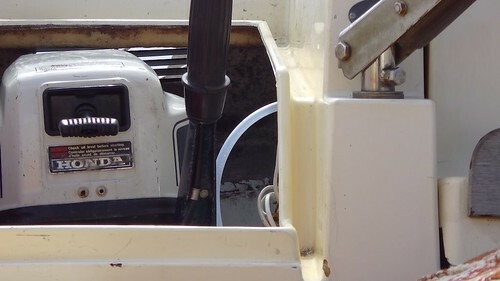 Tammy Norie’s bilge is too small to fit a proper electric bilge pump. 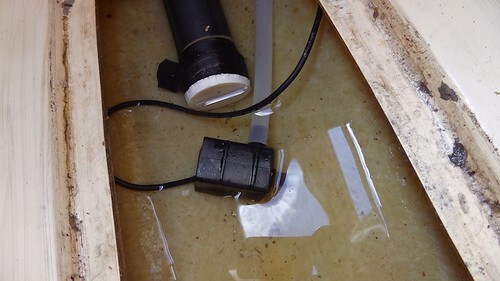 I bought a very cheap submersible Chinese pump from eBay, connected it to some narrow hose, and ran that alongside the main hose, then through an existing hole and into the engine well. This pump is not going to save any lives. 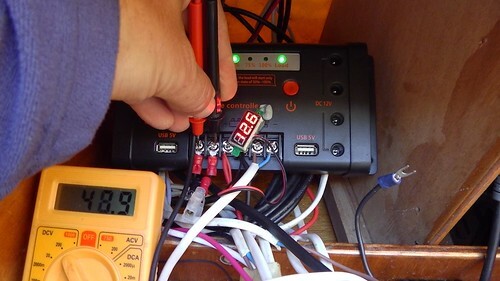 It takes a few minutes to empty even Tammy’s tiny bilge, but it’s nice to be able to press a button. And the installation interferes with nothing else. 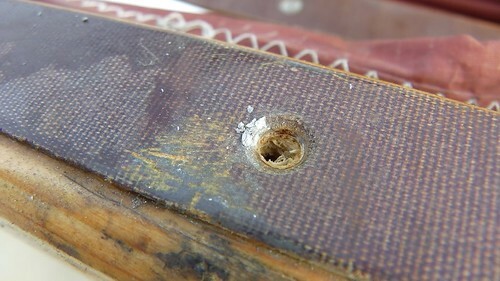 My old tiller pilot got wet inside, corroded, and stopped working. I sold the remains at a boat jumble. My uncle then gave me an old one he had in the attic. The same model. Great, except that it didn’t come with the mounting bar. Dad suggested the thread on the mounting socket might be a pipe thread. He was right! It’s a 20mm thread as used on 15mm copper pipe fittings. A quick visit to a hardware shop and I have a new mount. 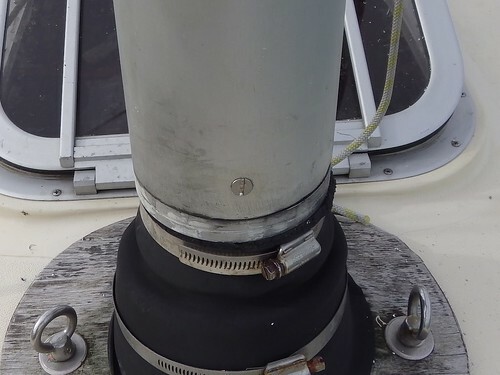 The mast hinge sleeve has a habit of walking around the mast until it jams up. 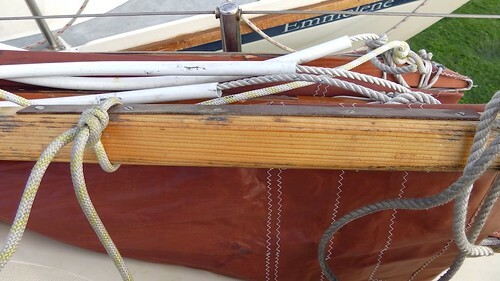 At one stage, I had to use a mallet to free it up so that I could lower the mast. So I’ve drilled and tapped a screw hole to keep it in place. This revealed a probem further up the sleeve. 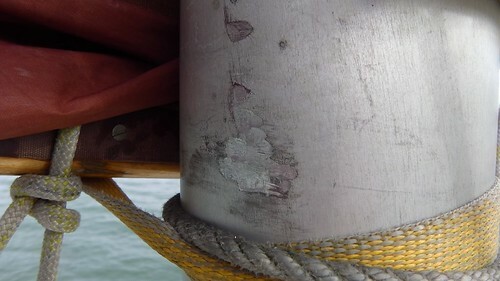 There were some quite deep gouges in the aluminium near the boom. The culprit? 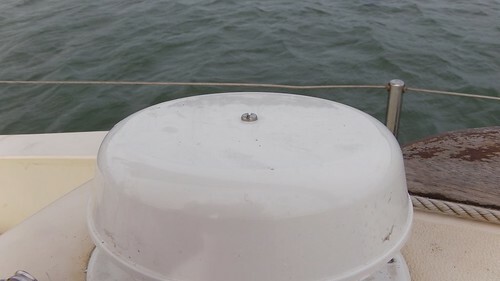 Countersunk screw heads sticking up from the strip of material on the boom designed to prevent chafing the mast! Fail. I’ve tightened up these screws on all the strips, and increased the depth of the recess in some cases. It might be better to use some other kind of fixing. 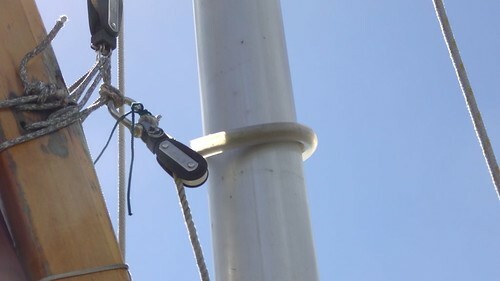 If you look carefully at this picture you can see that the screws at the end have been pulled inwards, as if the mast strip has shrunk, or the boom has grown. 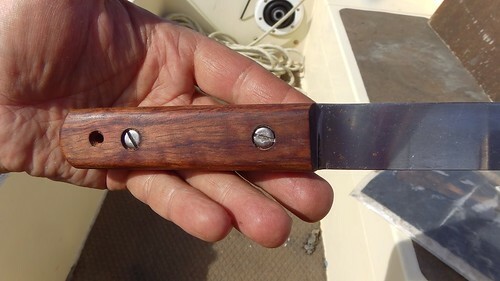 The rivets holding the handle to my Captain Currey rigging knife came apart, and the handle fell off. So I replaced them with nice machine screws in new recesses, oiled the handle, and sharpened the blade on my stone too. Lastly, I’ve been gradually working my way around the woodwork, rubbing off the old brown paint and some of the UV damage, then treating the wood with oil. You can see the contrast here. Imagine when it’s all done! 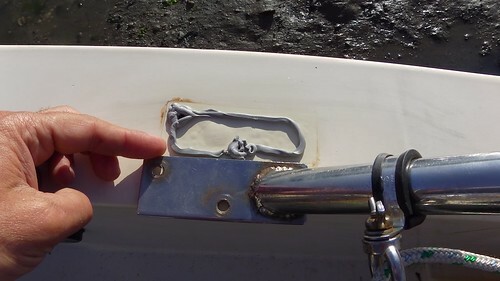 I’ve done the same to the tiller, but unfortunately I discovered that under the paint the tiller is not a very beautiful piece of wood. 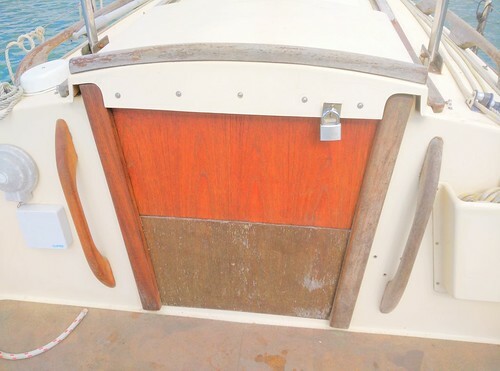 So that will be getting some new paint, and perhaps I’ll get hold of a bit of hardwood and whittle a new tiller on passage. That’s all for now. I hope you enjoyed seeing the small ways in which Tammy is improving.